About a year ago, I set out to find a keyboard that made using my desktop PC tolerable in the living room. I found the Logitech K400. It’s a small, inexpensive keyboard with comfortable keys, plenty of media center buttons and—most importantly—a built-in touchpad. Today, Logitech is launching an update: the K400 Plus. It’s... different. Not better. Not worse. The two models are almost identical, but there are little differences that set them apart. For starters, the new K400 Plus has a slightly tweaked keyboard layout, featuring smaller arrow keys, a larger right-hand shift button and slightly tweaked key-caps that make the buttons on the typewriter’s edge feel a bit larger. The keys are quieter, too—landing with a softer, more muted click than the original media center keyboard. There are a few other minor changes, too: the mouse buttons are a little thinner, the old keyboard’s dedicated home, lock and music buttons are now volume control toggles (the old functions are now special Fn combination keys instead) and the gray face of the keyboard is now gussied up with a bit of yellow accenting. I spent a couple of days using the two models side by side and.. well, I can’t say that any of the changes to the new keyboard are necessary. 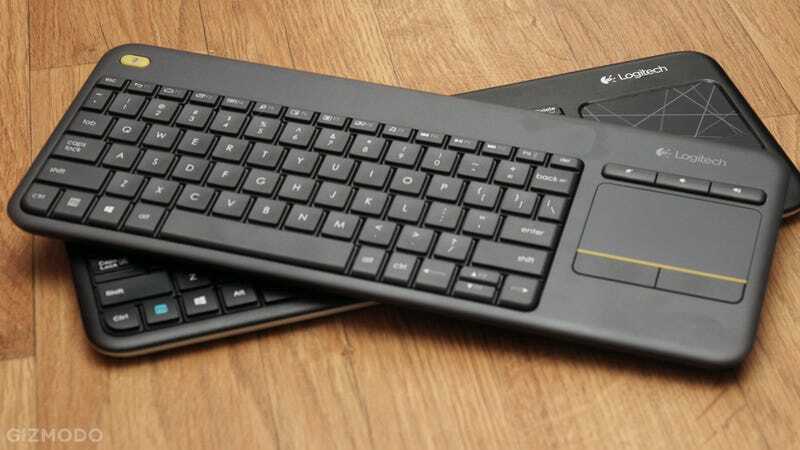 I don’t know what the “plus” is in the new Logitech K400 Plus keyboard. It’s still about the same size as the original model, offers the same level of convenience and comfort and is still the best way I’ve found to use my desktop PC from my couch. You can find the K400 Plus for $40, the same price as the original... except the original’s usually on sale for $22. Need a couch keyboard? Give it a shot.